HOLLYWOOD—Shirley MacLaine, the venerable Oscar winning actress and bestselling author, has traveled the world for work and pleasure throughout her six-decade career, but she dreads flying these days. At 80, the divorced Virginia native is still the saucy spitfire she was when she was 20 and making her big screen debut in Alfred Hitchcock’s “The Trouble With Harry.” Her beliefs in reincarnation, UFOs and New Age spirituality used to make some nonbelievers snicker. Now, MacLaine’s views seem almost mainstream in comparison to other celebrities’ out-there philosophies. In this adaptation of an Argentinean film, Plummer plays recent widower Fred, who moves into a New Orleans apartment complex at the insistence of his overbearing daughter (Marcia Gay Harden). Grumpy and disengaged with life, he remains in his bed most of the day, tended to by a maid. Then he meets his next-door neighbor Elsa (MacLaine), who claims to have lost her husband years earlier. Michael Radford (“Il Postino: The Postman”) co-wrote and directs this version. MacLaine says it was a pleasure reuniting with her “Canadian Companion” Christopher Plummer. (MacLaine’s mother, Kathlyn McLean, was from Nova Scotia.) The older sister of Warren Beatty, MacLaine hung out with the Rat Pack and claims to have had affairs with many of her co-stars. Married to businessman Steve Parker until their 1982 divorce, MacLaine has one daughter, Sachi. 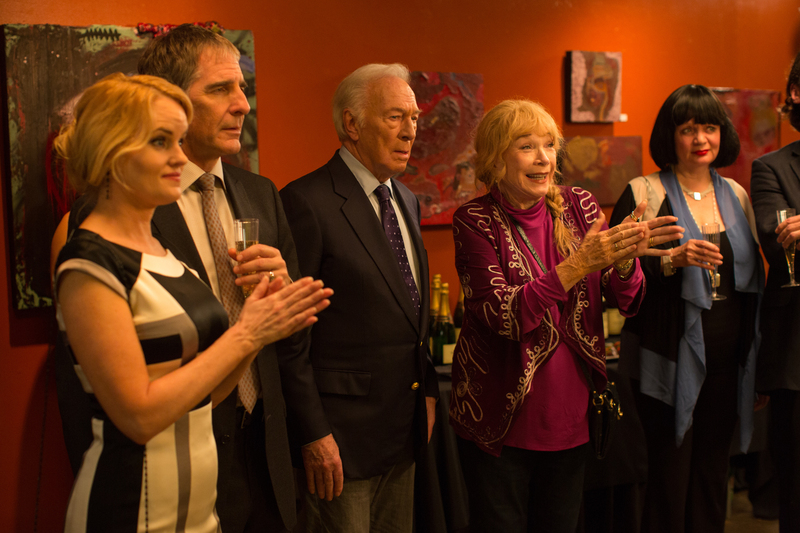 Though now in her golden years, MacLaine is pleased to be part of a film that shows a mature romance in a realistic way. Q: It was great to see you and Christopher Plummer working together again. Q: Were you two hard to handle on set? MacLaine: No. He’s very professional and so am I, apparently. I do love the moments when we had to be improvisational. I shoved stuff in his face and tripped him, which is what the director let us do, in relation to two old people falling in love. We just did whatever we did. Q: You have a couple of montage scenes in this. Are those difficult to do? MacLaine: What you don’t know is how you’re going to react without any rehearsal to what happens. If you don’t like your co-star, I don’t know how that would work. If I had to do a scene like that with Larry Harvey (her co-star in 1961’s “Two Loves”), for example, whom I loathed, I don’t know what I would do. Thank God, I either liked them or had affairs with all my co-stars. (She laughs.) So it was easy. Q: You have co-star approval, don’t you? MacLaine: Oh yeah, of course. But I don’t really do that. When you look back on your life and your work and what goes on in between setups and in between shots—that’s where the magic lies. It’ll either come out or not. But I’ve liked mostly everybody I’ve ever met in this business. Q: You’re also an author of 13 books. MacLaine: I love to write. I love to write about my stuff because nobody with a sense of humor is writing about this stuff, so I kind of have that niche. People are interested in this subject and point of view of someone who tells the truth in how I see it and how it’s progressed over the years from “Oh, she’s nuts!” to the opposite. Q: There was a time 20 years ago when people thought you were “out there.” Now, you’re considered normal. That’s amazing, isn’t it? Q: So you don’t think aliens would be friendly if they arrived on earth? MacLaine: Apparently he doesn’t. Those people, apparently New Agers, who think (aliens) are going to come and save us all—uh-uh. I would say, “What about our own human history about who we are and how we strive to be, and do we get along or not?” We’re really into that right now, if you ask me. Look at the world. It’s a mess. There’s a natural proclivity to want some help. Every country, except for ours, has disclosed their understanding of this phenomenon. Q: Back to the film. Elsa is so positive and optimistic and has a joie de vivre. MacLaine: Wait a minute; we don’t know that. She knows she’s dying. That’s what was complicated about playing her. It’s like, “Do I want them to know?” or “Do I want (my loved ones) to think I’m okay.” That’s not revealed until two-thirds into the movie. Q: Have you known people who are facing a terminal illness and faced it like Elsa? Q: I’ll bet filming in New Orleans was great. MacLaine: Not for me, because there’s a lot of mold there since (Hurricane) Katrina. I was sick during the whole film, actually. Q: It was cold in Rome when you shot those scenes, right? MacLaine: Yes, and we were working at 6 a.m. But that’s the way it is. Q: Did you see the Argentinean film before you did this? MacLaine: Oh yeah, but I didn’t want to watch it again because the films are completely different from each other. Q: Elsa has a son who’s overbearing and tight with money? MacLaine: Both sets of kids are like that. Maybe the theme of the picture is both Elsa and Fred in this point in their lives, what little meaning materialism has. All these younger folks think it’s everything. That’s what I hope the audience gets so they can give up some of this materialistic competition that we go through with each other. Q: You’ve chosen not to ignore what’s going on the world and not hide yourself away in a castle. MacLaine: Oh, I come in and out. I live in a gorgeous place that’s basically three stories in Santa Fe with an incredible view. I have a patio of trees and waterfalls and things. There’s a view from every window. Sometimes I’m there for seven to 10 weeks and never leave my house. Q: And yet you maintain a connection with what’s going on in the world, right? MacLaine: Yeah, I’m a news freak. Q: Have you always been that way? When you were young and just tasting success, were you more materialistic? MacLaine: Oh yeah. I went to the Daisy every night and hung out with the Rat Pack and went to Vegas on the weekends. Sure, but I was always the one that would travel around the world and get off in Calcutta because I’d never been there. Other people were traveling with entourages or a security guard but not me. Q: Have you finished filming the comedy “Wild Oats” yet? MacLaine: Yeah. I worked with Billy Connolly and Howard Hesseman who were hysterical. I laughed so hard. I laughed for seven minutes. Q: You’re on Twitter. Do you respond to your Tweets? MacLaine: Are you kidding? I barely answer the telephone. No! I don’t get it. Q: Are you returning to “Downton Abbey” as Lord Grantham’s mother-in-law Martha Levinson? MacLaine: Ask (show creator) Julian Fellowes. I’d like to know the answer to that question myself. Q: You want to come back, right?